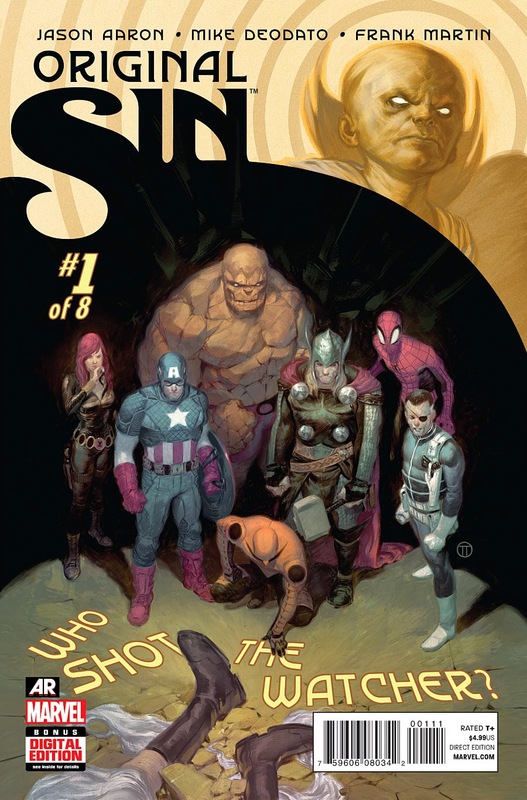 Matt C: The headline grabbing title of the week, for me at least, is the proper beginning of Marvel's summer event, Original Sin (I think we've all decided that the issue #0 from a couple of weeks back will have next to nothing to do with the main storyline). Over at DC, they're unveiling New 52: Future's End, and while I was surprised by how much I enjoyed the FCBD #0 issue, I've no real intention of getting involved with a weekly series set in a universe I've steered clear of for the last year or so. A whodunit featuring a dead Watcher is a lot more appealing, particularly when you consider Jason Aaron and Mike Deodato are at the controls. Over it Image, the #1 I'm keen to get my hands on is Nailbiter from Joshua Williamson and Mike Henderson. These are the guys responsible for the excellent digital comic Masks & Mobsters, and while that series is currently MIA, I'm hoping they can apply the same kind of inventive approach to the serial killer genre that they did with their Golden Age/gangster mash-up. Stewart R: This week's pull list is surely proof that Marvel's All New Marvel NOW! initiative has been nothing but a sheer success; I'm set to pick up Iron Fist: The Living Weapon #2, Moon Knight 3, She-Hulk #4, Punisher #5 and Black Widow #6 tomorrow and I'm honestly surprised by just how much of this new publisher push has managed to resonate with me. Admittedly the young pups in the basket, Moon Knight and Iron Fist, have still yet to 100% prove themselves, but they're looking good from the early work put out by both creative teams and I'd be surprised if I closed each issue tomorrow and felt disappointed. I have a similar feeling when it comes to Bad Blood #5 delivering a worthy finale to what has been a very enjoyable vampire series from Dark Horse. Jonathan Maberry has kept the cast small, kept the mood dark and managed to hit the emotional mark with the struggles that the unlikely partnership of cancer-sufferer Trick and junkie Lolly have faced and before the final curtain has fallen I'll even dare say that this is already on my shortlist for miniseries of the year.